As I write this, I’m at about 30,000 feet – somewhere in the air between Oakland and Denver – on my way back to Nashville. I’ve just spent the last 3 days at MRA’s CEO Summit in Napa Valley. What a great event… kudos to the MRA staff (David, Amy, Jenn & Jess) and hosts like Merrill Dubrow and Steve Schlesinger. It started with the keynote speaker, Phil Terry, a Harvard MBA and consultant who evangelizes and facilitates peer-to-peer networking groups amongst professionals. Take a look at his company, Collaborative Gain. The peer-to-peer idea then came to life in the breakout sessions. After each speaker delivered their presentation, all of the attendees would break up into small groups (5-6 at each table) and have an open and honest discussion about the topic just presented. All of those table participants… each with a different background and experience set, each providing different perspectives and ideas… the roundtables were incredibly helpful and eye-opening. And a little humbling. To sit around with a bunch of other senior-level professionals willing to share their experiences and expertise showed each of us just how “in the box” our thinking can become… and how a fresh, objective perspective can really open your eyes. By the way, there are some really smart people in our industry. 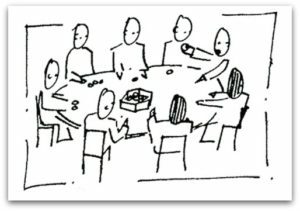 The experience got me to thinking… shouldn’t each of us have access to some sort of “advisory council” as a frequent and consistent resource? Outsiders who challenge us and keep us striving for more? Smart, objective professionals who provide their unique perspectives? If you don’t have a Board of Directors or if a relevant peer-to-peer group isn’t available to you, I would challenge each of you to consider establishing some sort of advisory council to have as an on-going resource. Meet 3-4 times each year. Share ideas, plans and financials. Be open to feedback and criticism. But mostly, use it as a way to do something we don’t do often enough… to ask for help. Think of it this way… if 2 heads are better than 1 – then 5 or 6 would be remarkable!